A tax break that would save Delta Air Lines millions of dollars on jet fuel purchases appeared to be sailing through the Georgia legislature without much opposition — until the airline cut business ties with the National Rifle Association. “We should never be forced to choose between our values and growing our economy. We stand for both!” he tweeted shortly after his “Fox & Friends” appearance. As fallout from the deadly Valentine’s Day school shooting in Florida engulfs Georgia politics, Republicans lined up against Delta are once again demonstrating powerful support for gun rights in the state. The GOP-controlled legislature in recent years has greatly expanded the rights of licensed gun owners to bring their weapons to bars, schools, college campuses and even some government buildings. 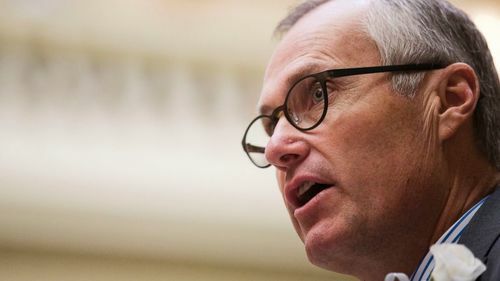 Four of Cagle’s Republican rivals in the 2018 governor’s race say they also oppose any tax breaks for Delta since the Atlanta-based airline announced it would no longer offer discounted rates for NRA members flying to the group’s conventions. One GOP candidate, Secretary of State Brian Kemp, suggested using the jet fuel tax money for a Fourth of July tax-free “holiday” on gun and ammunition purchases. “We should give a tax break to hardworking Georgians who want to protect their families and loved ones from criminal aliens, terrorists, and gang members,” Kemp said in a statement. As GOP candidates proclaimed their support for gun owners ahead of the April gubernatorial primary, other top Republicans at the Georgia Capitol avoided the fray as officials worked behind the scenes to find a resolution. Republican Gov. Nathan Deal, serving his final year in office, had no comment on the Delta flap Tuesday, spokeswoman Jen Ryan said. In the past, Deal has opposed social conservatives in his own party on issues the governor feared might tarnish Georgia’s business-friendly reputation. “I think this additional issue where they were treating (the NRA) different from all the other organizations pushed a lot of the members over the edge,” Hufstetler said. “I think most of us would have voted for it” before Delta crossed the NRA, GOP Sen. Fran Millar of Dunwoody said. Delta employs 33,000 workers statewide in Georgia, and its busy Atlanta hub has made Hartsfield-Jackson International Airport the busiest in the world. Although Cagle’s threat to kill the tax cut may win fans among GOP voters, it could also backfire when it comes to recruiting business — most notably Georgia’s status as a finalist for Amazon’s planned second U.S. headquarters, said William Hatcher, an Augusta University professor who studies economic development. Delta spokesman Anthony Black declined comment Tuesday and would not name any other groups that receive discounted fares from the airline. Democrats, who control roughly one-third of the votes in both the Georgia House and Senate, have criticized Cagle and other Republicans. “This shows that we’ll pander to the extreme elements instead of our big companies and try to interfere in their business decisions,” said Sen. Elena Parent, an Atlanta Democrat.